The Weeks recorded this, their second album in Ardent studios in Memphis. Although they come from Nashville (and are moving to Mississippi), they chose to record in Memphis to get away from the usual routine at home. 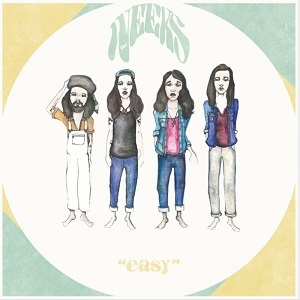 The title "Easy" is explained by frontman Clyde Barnes as... "We called it Easy because every time I make music with these guys, it's easy, if feels good". Havign had their first album and an EP released on the record label owned by Kings of Leon and touring with them will no doubt have helped introduce them to a wider audience. It's mid-paced rock, never too loud or aggressive, but equally never particularly exciting. It's well done and has a cheerful upbeat feel to it, and is likely to appeal to a wide audience as it sits in that radio-friendly pop-rock area. For me though it's not got enough balls to be a proper rock album. Check out the video for "Talk like that" and hear for yourself how they sound.